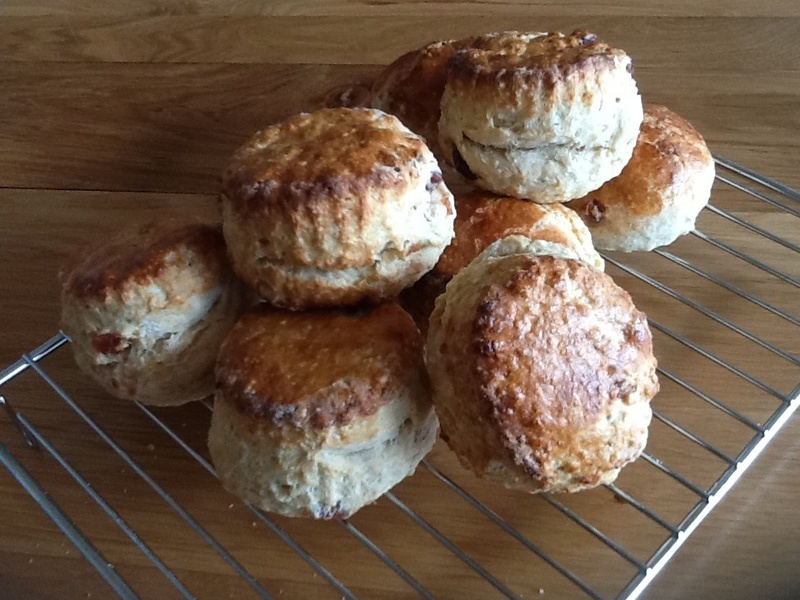 I used to find making scones tricky – they would often be more biscuit like and not the fluffy large treat I wanted them to be. My son trained as a chef and in one job one of his tasks was to produce 200 scones at a time – perhaps two or three times a week. They were beautiful, always successful and hugely popular. The trick seemed to be a wetter dough and actually making them a bigger size to begin with – at least an inch thick. His recipe was full fat milk but I often use up buttermilk that I buy for soda bread etc. You may wish to add cherries, sultanas or other dried fruit. I added 12 glacé cherries chopped up. 1. Preheat the oven to 220C (200C fan assisted)/425F/Gas 7. 2. Lightly grease a baking tray with butter and line it with baking or silicone paper (not greaseproof). 3. 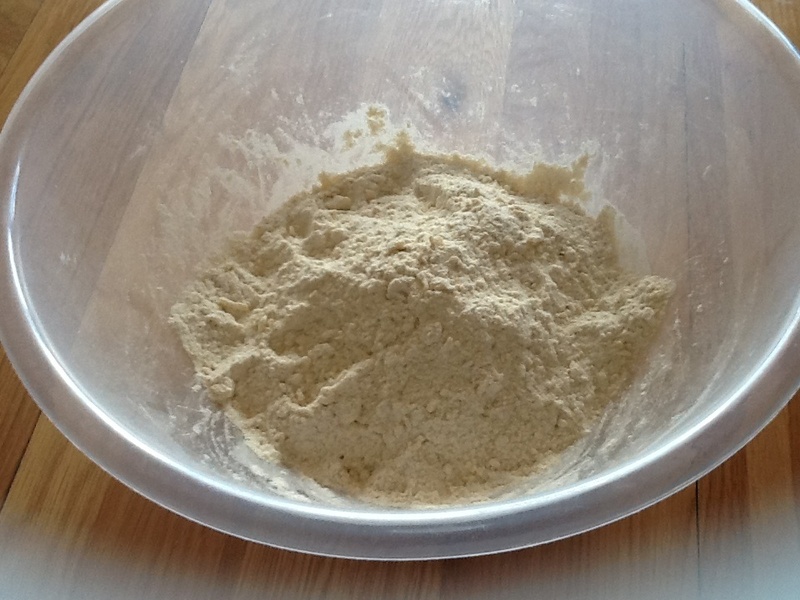 Put 450g of the flour into a large bowl and add the butter. Rub the flour and butter together with your fingers to create a breadcrumb-like mixture. 4. Add the sugar, eggs and baking powder and fruit if used, and use a wooden spoon to turn the mixture gently. Make sure you mix all the way down to the bottom and incorporate all of the ingredients. 6. Tip the soft dough out onto a floured work surface and sprinkle a little of the flour on top. The mixture will be wet and sticky. 7. Use your hands to fold the dough in half, then turn the dough 90 degrees and repeat. Do this a few times until you’ve formed a smooth dough. If the mixture becomes too sticky use some extra flour to coat the mixture or your hands but be careful not to overwork your dough. 8. Next roll the dough out: sprinkle flour onto the work surface and a little on the top of the dough, then use the rolling pin to roll up from the middle and then down from the middle. 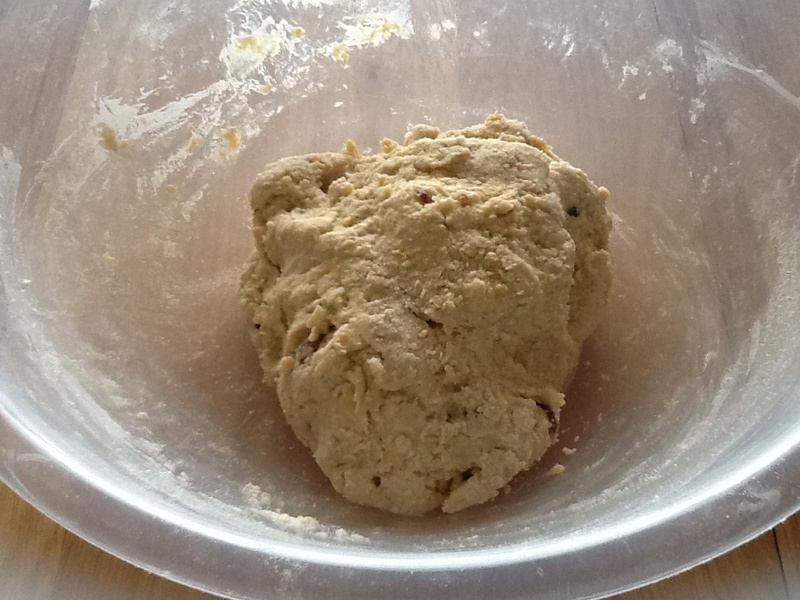 Turn the dough by 90 degrees and continue to roll until it’s about 2.5cm/1in thick. 9. Using a pastry cutter, stamp out rounds from the pastry and place them onto the baking tray. Dip the edge of the pastry cutter in flour to make it easier to cut out the scones without them sticking. Don’t twist the cutter – just press firmly. 10. Once you’ve cut 4 or 5 rounds you can re-roll the dough to make it easier to cut out the remaining rounds but the resulting scones won’t be as fluffy. 11. 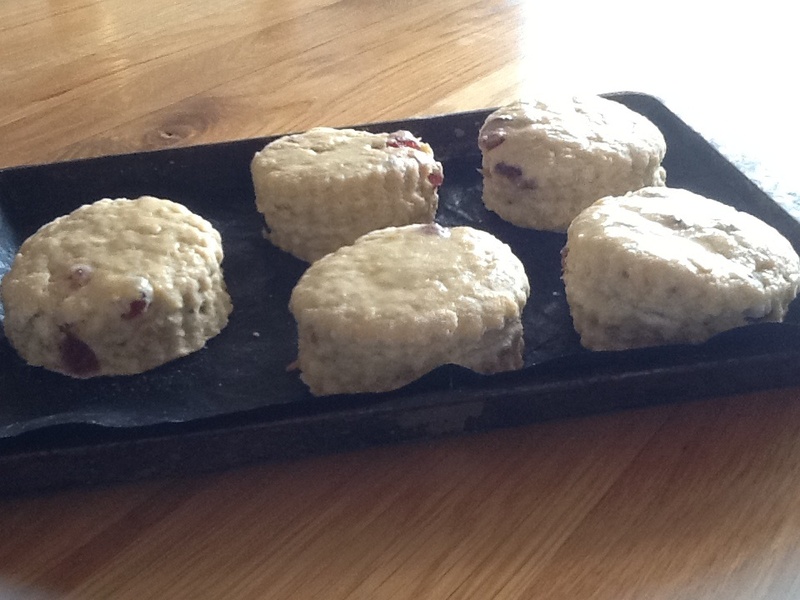 Place the scones on the baking tray and leave them to rest for a few minutes to let the baking powder work. Then glaze them with the beaten egg. Be careful to keep the glaze on the top of the scones. (If it runs down the sides it will stop them rising – Paul Hollywood tip!). 12. Bake the scones in the middle of the oven for 15 minutes, or until the scones are risen and golden-brown then leave to cool on wire rack. Thank you so much – I love your blog and bakes too!